The Modulizer is a tool for professional name-finders to give name ideas the perfect finish. It is especially good at polishing invented words and turn them into real names. You can also apply it to descriptive terms like marketing to change them into something unique. The Modulizer is a little different from the other tools of in the Name Factory: Unlike Supplementer, Merger & Co., it doesn't provide automatic name suggestions, but rather offers various functionalities to modify existing keywords by varying, shortening and extending. 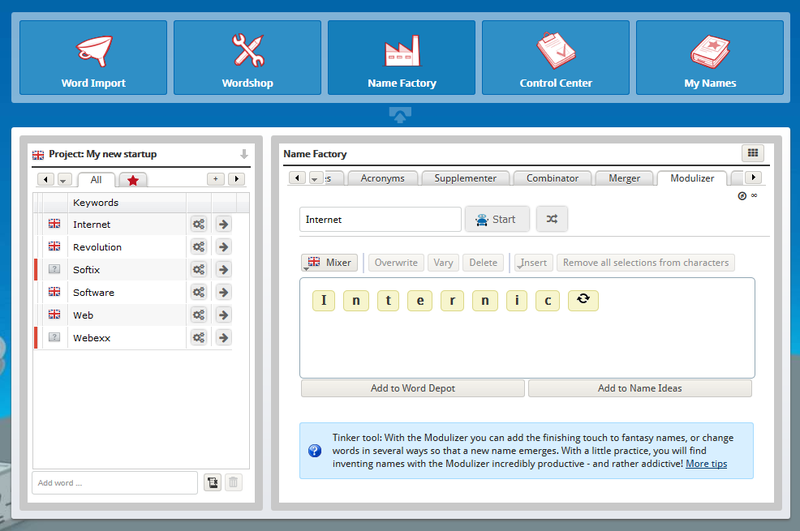 The Modulizer works on the letters of a word and allows you to edit names ideas in detail. You can mark certain letters of a word and 'vary' them. This means: Marked vowels are replaced with other vowels, while consonants are replaced with other consonants. This changes your name ideas in a systematic manner until you find something you like. Let's look at an example with the word marketing - e.g. as a name for an advertising agency. First, we change the "M" to a "T" and get "Tarketing". If we now change the "K" to a "G", we get "Targeting". As a next step, we can further modulate "Targeting" and let the tool vary the "I". Now we get a result like "Targetong" which still sounds a little weird, but leads us to the idea of deleting the last two characters, leaving us with "Targeto"! For two minutes work, that's already a pretty decent name for an advertising agency. Perhaps it would sound even better with another "N" after the "E". "Targento"! Hey, that sounds kinda nice, doesn't it? Change your preliminary names until you are perfectly happy with them. Go to the Modulizer tool in the Name Factory right now to test it out! If you don't have a NameRobot account yet, simply register and start looking for a name!